Garson, G. D. (2017). Narrative Analysis & NPF. Asheboro, NC: Statistical Associates Publishers. @c 2017 by G. David Garson and Statistical Associates Publishers. worldwide rights reserved in all languages and on all media. Permission is not granted to copy, distribute, or post e-books or passwords. A graduate-level introduction to narrative analysis, including the Narrative Policy Framework (NPF) and related theories, including Cultural Theory. Coverage of NPF, narrative analysis, types of narratives, discourse analysis, the narrative paradigm, Cultural Theory, DeLeuzian approaches, and related narrative theories and approaches. 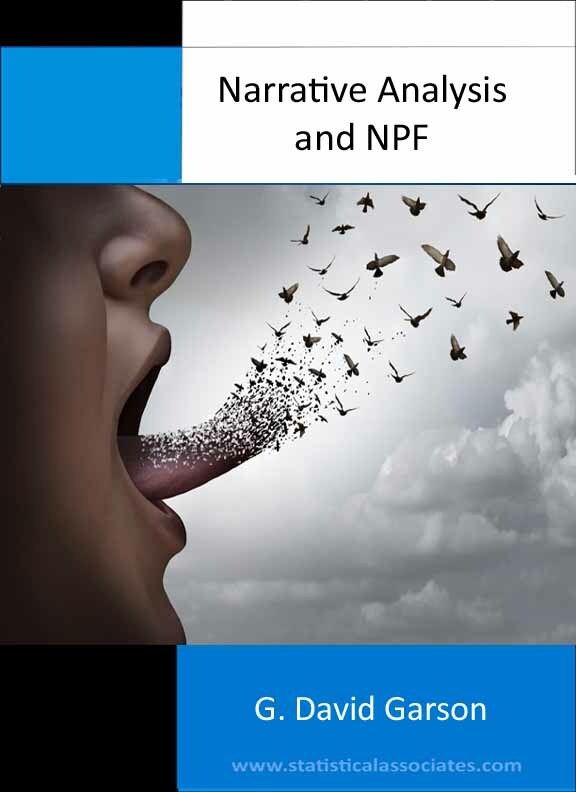 NPF has emerged since 2010 as a leading mixed methods approach to analysis of matters of widespread policy controversy, such as climate change, energy policy, immigration, obesity, genetically modified food, and many other domains. Extensive new sections on the narrative policy framework. Inventory of illustrative NPF hypotheses at the micro, meso, and macro levels of analysis. Updated coverage of narrative analysis software.